After experiencing three consecutive quarters of solid FX volume results between Q3 2014 to Q1 2015, activity at Hotspot FX has been on the decline. The fall continued in July, as average daily volumes (ADV) for the month were 8.6% lower than June to $23.51 billion. 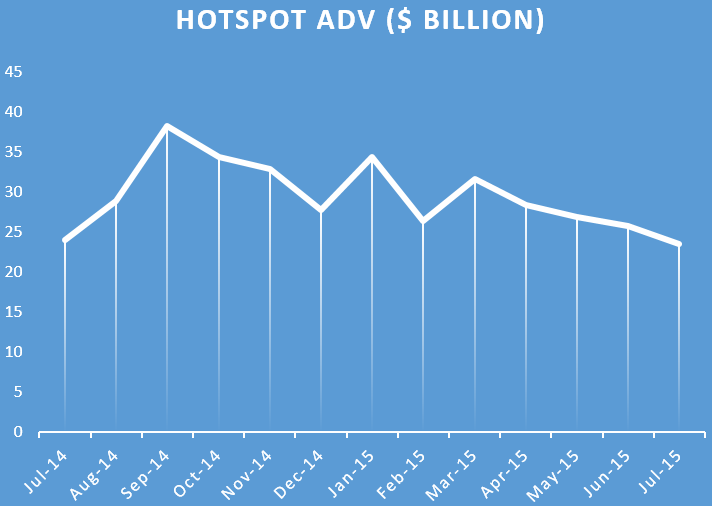 The figure was the lowest recorded month ADV at Hotspot since December 2012. The multi-year low occurs as most trading venues and broker have experienced a drop off of volumes from Q1’s levels. However, Hotspot specifically has underperformed its rivals. Like Fastmatch which has been unable to return to volume levels prior to January’s Swiss franc volatility, Hotspot appears to be similarly be affected by changes taking place in the FX market. Specifically affecting many players has been a contraction of credit available from major foreign exchange prime brokers (FXPB) as well as higher commission prices from them. As a result, many buy-side funds have received termination notices from their FXPB’s or instructions to increase collateral. In relation to Hotspot, the FX ECN may be affected by this changing climate in the industry if their clients are among those scrambling to source new credit relationships to trade on the platform. Speaking with representatives of BATS Global, they responded to Finance Magnates that they don’t pin the drop in volumes to any specific reasons other than market fluctuations. They added though that for BATS, Hotspot remains a long term business acquisition, of which the month to month performance is less important than their overall longer term strategy, of which includes the coming launch of a London based matching engine.